The rigorous ice-climbing training of the previous day had left many tired. 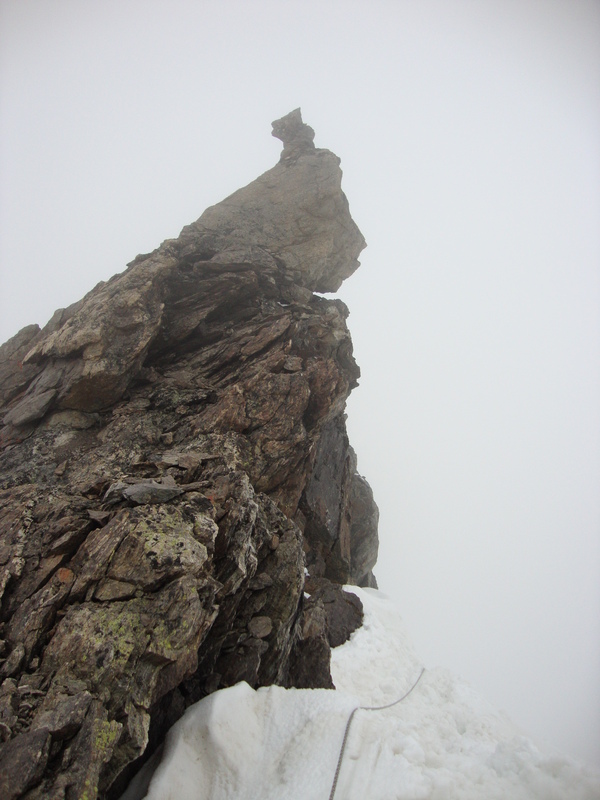 However, as we all knew, it was just the beginning: the peak of Mount Gidan at 4167 metres wasn’t even visible yet. I cooked some buckwheat and tea for breakfast, and just after 8 am we were ready to continue up the mountain. 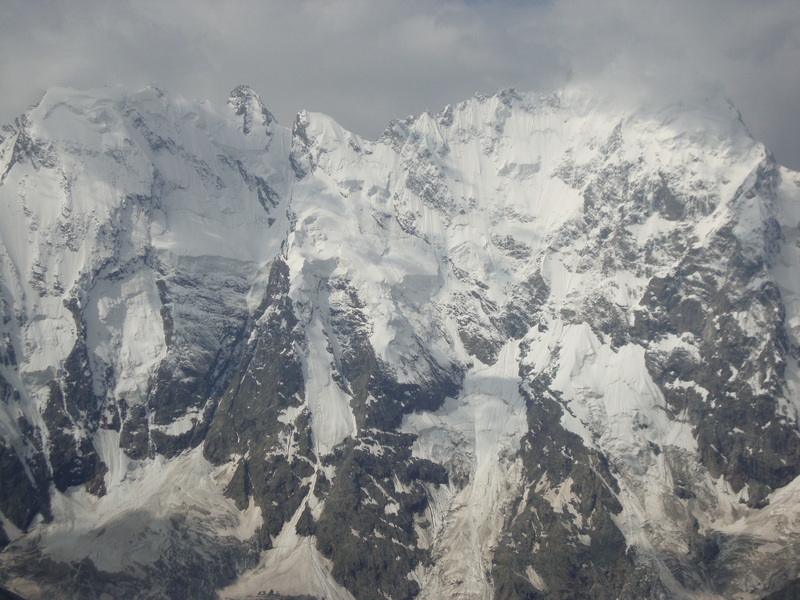 The climb to Mount Gidan base camp, known as Teplii Ugol, would be steep and long – an estimated three to five hours on a hot, sunny day. Looking up the near-vertical slope I could barely see the path, notorious for accidents with people falling down and injuring themselves. Fortunately, no such thing occurred in our group: panting, sweating, and swearing – as usual – we all arrived safely in Teplii Ugol at different times. To my surprise, I was among the first to reach base camp at noon. 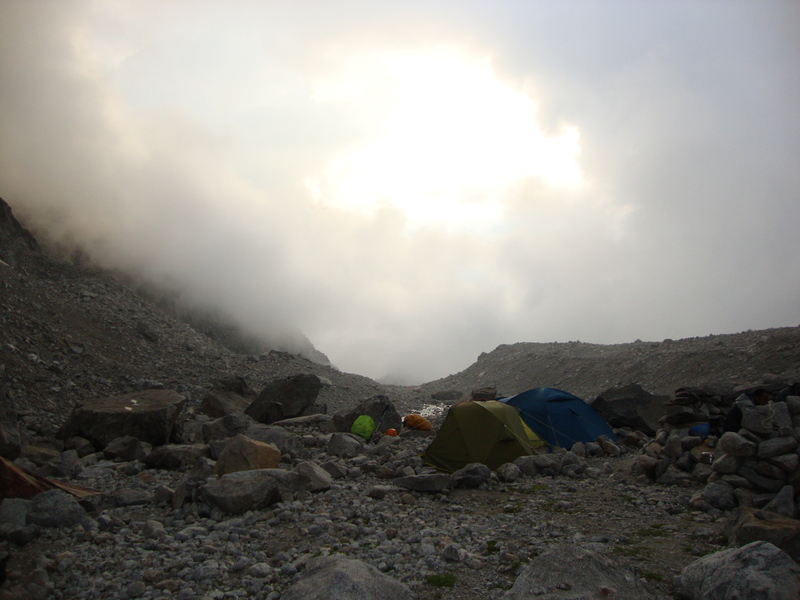 We would relax and prepare for the climb for the rest of the day and would leave base camp at 3 am on our summit push. As we headed into our tents for a bit of sleep after dinner, a storm started. Thunder, lightning and heavy rain were not very promising signs, and I couldn’t sleep at all, diving deeper and deeper into my wet sleeping-bag, listening, hoping that the storm would end before our planned departure time. End it did not, not till 6 am, when we were finally able to leave for the summit. Crossing the wet scree and boulders of the two moraines which separated us from the mountain, we often slipped and doubted our ability to get even as far as the foot of the mountain, not to mention any further. Two other groups of climbers were behind and one, the least experienced, ahead of us – they’d left at 3 am, during the storm. At around 8.30 we were already high up Mt Gidan, at the spot where the first fixed ropes had to be placed. The weakest group, as the first up the mountain, took charge of the task and, refusing all offers of help, wasted as much as six hours in the process. It had snowed heavily, and we were advised to use crampons and fix more ropes than is usually necessary on Mt Gidan. We also had to pass the rock-climbing section all the way to the summit wearing crampons, which undoubtedly slowed us down further and felt rather clumsy. Our group hit the tiny summit of Mt Gidan just after two, exhausted and truly happy. As I looked around me, I couldn’t recognize the world I was looking at – it was entirely different: enormous and mighty, quiet and powerful. It’s into the mountains, I feel, where all the strength and vitality of the Earth has retreated from us, who fear it and evict it from our ever-growing cities and our little lives. It humbled me to see that that power was still there, and it scared me to think that one day it might be unleashed to grind us to dust. The way down wasn’t easy as the other two groups were still coming up and the slowest group was coming down ahead of us – one fixed rope serving us all. Eventually, at 7 pm, we were back in Teplii Ugol, more dead than alive, our feet blistered and bleeding from the swift decent down the very steep slopes of the mountain. Yet, we’d done it, and when the fatigue finally left the group members’ faces, one could see the happiness, the confidence and the calm a successful climb always brings. After a relaxed, quiet dinner, we all slept beautifully in our wet tents, wet clothes, wet sleeping-bags, and with stupidly happy faces. I get exhausted just reading this….again an excellent write-up. Thank you! The day of the climb was tiring, indeed: in total we spent about 13 hours on the mountain; it was a tough but a very fulfilling day. And you brought a little of the strength and calm down inside you…first Gidan – next, anything you want. Well done. You have my respect in spades! You conquered more than just the peak I think. Thank you for your support and encourgement, Sally! I definitely feel like I have conquered more than just Mt Gidan.